Parmesan Broiled Tilapia is a quick and simple tilapia recipe that is so light and flaky. This easy recipe is on the table in 10 minutes start to finish! Turn broiler onto high and adjust oven rack to the top. In a small bowl, combine all ingredients except the tilapia. Set aside. 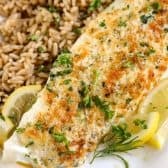 Place tilapia fillets on a foil lined pan. Broil for 3 minutes. Remove from the oven, flip over and divide the parmesan mixture over the uncooked sides of the tilapia. Return to the oven and broil an additional 3-4 minutes making sure not to over cook the fish.